Pick your economic worry — there’s more than enough to go around: mortgage crisis? faltering U.S. economy? government deficits? skyrocketing oil prices? geo-political instability? rising inflation rates? As a financial planner, I see and feel the anxiety that my clients are experiencing. For most, the anxiety peaks each quarter with the arrival of their once-welcomed, now-dreaded brokerage statements. More than a few are disappointed to find their investment balance well below where it was a year ago — despite having made periodic contributions. If you factor in the popular media’s doom and gloom outlook, you have the perfect storm of investing negativity. 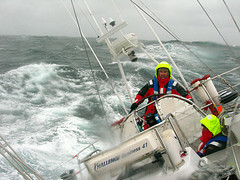 In these stormy times, I try and help my clients see over the waves and through the fog. Selling out and fleeing the market may feel right, but it flies in the face of the best advice you’ll ever get about succeeding in the stock market: buy low and sell high. With the S&P 500 off more than 15% in the past year, perhaps it helps to think of the market as being temporarily on sale? By leaving the market now, you’re also implicitly betting that you can time the market and successfully re-enter when it begins to rise once again. In my experience, this rarely happens. Instead, market timers often end up buying back into the market at or near its next peak. They’ve thus sold low and bought high. Worse, cash itself is not an overly attractive alternative to the market at the moment either. Between taxes and inflation, most so-called safe havens are actually losing ground in real terms. If your savings account yields 3-5%, you’re losing spending power, not preserving it. As I advise my clients, (almost) every portfolio benefits over time from equity investments: if you want to grow your net worth in the long-term and outpace taxes and inflation, you need to be in the market. To the extent you’re anxious about the market and your risk exposure, I strongly encourage a rethinking of your asset allocation. Are you perhaps over-invested in the stock market? Maybe you’re over-invested in certain parts of the stock market? Or, perhaps you’ve overlooked ways to dampen volatility with non-traditional investment classes? 1) When should I invest? 2) Where should I invest? 3) How should I invest? this show was informative as usual, however I can’t wait till the next show! Everyweek I listen to brian’s podcast and I have to say I am impressed with how he does his shows. Thanks for all the valuable information!